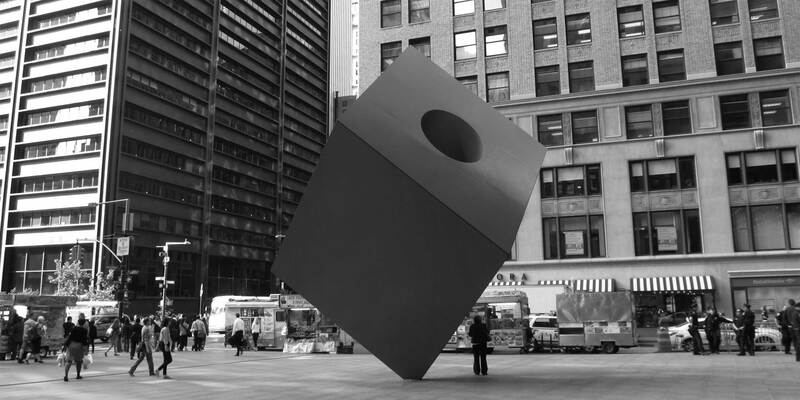 As one of the city’s strongest advocates for the preservation of quality public open space, the Municipal Art Society of New York (MAS) recognizes the landmark plaza at 140 Broadway as an iconic part of Lower Manhattan’s public realm. When the Marine Midland Building was first constructed in 1967, Ada Louise Huxtable described the plaza as one of the city’s best. The Cube at the Marine Midland Building, 140 Broadway. Photo: Wikimedia Commons, Ken Lund. Be that as it may, this application is not driven by an interest in restoring it. The alterations are intended to achieve quite another objective – the expulsion of food cart vendors from the premises. Seven enlarged circular planters based on SOM’s original design and 12 lighting stanchions serve this purpose on Cedar Street, while five standard NYC benches and four steel planter boxes block food carts on Broadway. There is no design relationship between these interventions, simply the common goal of obstruction. The applicant maintains that the piecemeal approach is a result of the many entities with separate jurisdictions involved in the approval process for this project. The Department of City Planning (DCP) has purview over the Privately Owned Public Space and zoning aspects of the design, LPC controls the landmark site, and the Department of Transportation (DOT) is responsible for granting the revocable consent to place the seating and planters along Broadway. This internal wrangling becomes evident in consideration of the property line. DCP and LPC do not have authority over the Broadway street furniture proposal because they are technically on the sidewalk, which falls under DOT jurisdiction. At the same time, the project team has argued that they need the stanchions not just to improve lighting on Cedar Street, but also to demarcate the property line because the plaza reads as one continuous design. We feel strongly the entire plaza must be considered as a whole, and that any alterations must preserve its character and design, while also making it inviting to pedestrian traffic and public enjoyment. It is clear that a more comprehensive design and coordinated agency review is necessary to fully address this project. We believe such an approach is much more likely to achieve a successful outcome. Therefore, we urge that such a process be initiated before any Certificate of Appropriateness is granted.